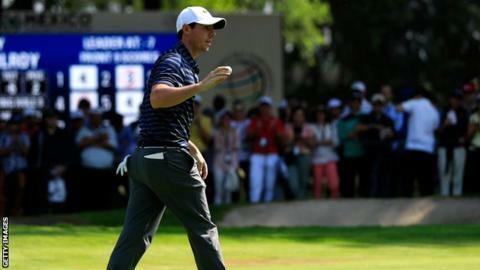 Rory McIlroy carded a stunning six-under-par 65 to take a two-shot lead at the halfway stage of the World Golf Championships event in Mexico. The Northern Irishman is nine under after a round that included an eagle, as he holed out from 151 yards on the par-four 14th, and six birdies. Americans Phil Mickelson and Justin Thomas are tied for second with England's Ross Fisher. Another Englishman, Andy Sullivan, is on five under after a 65. He is tied for fifth with world number one Dustin Johnson, while England's Tyrrell Hatton is a shot further back. Hatton's compatriot Lee Westwood, the joint overnight leader, stayed at four under after a level-par 71 and is in a five-way tie for 14th that includes compatriot Matthew Fitzpatrick. World number three McIlroy, 27, is playing his first tournament after seven weeks out with a rib injury. His round could have been even better but he bogeyed the 12th and 17th. "I'm in a great position, but I felt like I could have been a few more ahead," said McIlroy. Olympic champion Justin Rose shot a 72 to move to level par, while American Jordan Spieth is one over and Masters champion Danny Willett is six over.